"What kind of trouble have you gotten yourself into?" Samuel Goldwyn Films has released an official trailer for an indie drama titled Allure, which premiered at the Toronto Film Festival last fall. The indie drama is the feature directorial debut of filmmaking brothers Carlos Sanchez and Jason Sanchez, and stars Evan Rachel Wood as a woman who has experienced abuse in her past, now working as a house cleaner for her father's company. She meets another young woman named Eva, played by Julia Sarah Stone, and they make a deep connection that helps them both move forward. The film received some strong reviews, mostly praising Evan Rachel Wood and her performance as "frighteningly good." The main cast includes Denis O'Hare and Maxim Roy. This looks like a very important, emotional drama that will mean a lot to women. Laura (Evan Rachel Wood) works as a house cleaner for her father's company but her personal life is not so pristine. Rough around the edges, looking for love in all the wrong places, her heartbreaking behavior points to hardships of the past. One day on the job, in yet another house, Laura meets Eva (Julia Sarah Stone), a quiet teen unhappy with her disciplined life. In Eva, Laura rediscovers an innocent tenderness. In Laura, Eva finds a thrilling rebel who can bring her into unknown territories. The mutual attraction soon morphs into obsession as Laura convinces Eva to run away and secretly live with her, perilously raising the stakes for the young, impressionable girl as Laura's emotional instability becomes increasingly clear. As their world closes in, they must unearth certain truths to find a way out. Allure is both written and directed by filmmaker brothers Carlos Sanchez and Jason Sanchez, both making their directorial debut. The film first premiered at last year's Toronto Film Festival, and also played at the Hamburg Film Festival. 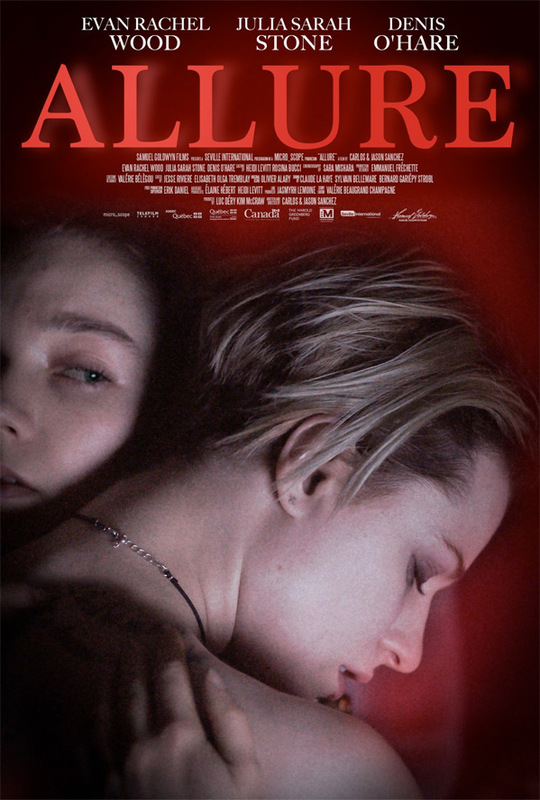 Samuel Goldwyn will release Allure in select theaters + on VOD starting March 16th. Interested?